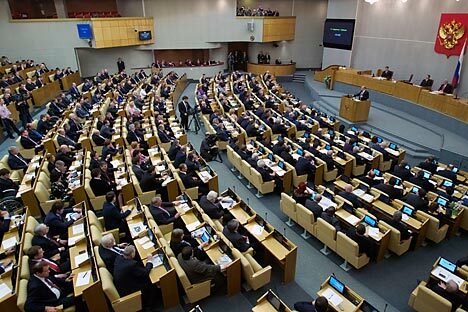 The State Duma has approved the first reading of a bill that allows the relatives of terrorists to pay compensation for the damage inflicted during their attacks. The families of convicted terrorists may have their assets confiscated if new proposals that have passed the first hearing in the Russian parliament become law. Experts say that collective responsibility measures would be counterproductive. Many argue that corrupt officials, rather than terrorists, should be the prime target of such initiatives. If the checks uncover sufficient reasons to believe that the assets in question were acquired through terrorist activities, those assets will be confiscated and used to pay compensation to victims of terrorist attacks. The families of suspected terrorists will have to face questions only if and when the suspect has been convicted, and once the court ruling has entered into force. In the event of suicide attacks, positive identification and DNA testing of the terrorist's body will most likely be considered sufficient evidence. Vladimir Osechkin, a member of the Council for Public Controls at the Russian Duma, says that the proposed legislation requires a broad public debate involving experts and human rights activists. Osechkin also insists that, before the new legislation can be passed, it should be scrutinized for any potential violations of constitutional rights. There are also worries that a hastily conducted investigation could mete out an unjust punishment to the families of those convicted on terror charges. Maryam Akhmatova is the head of the Mothers of Kabardino-Balkaria for Civil Rights and Liberties nongovernmental organization. Her son is facing charges in connection with a terrorist attack in Nalchik, southern Russia, in 2005. She believes that, given the current state of the Russian law-enforcement system, the proposals must not be allowed to become law. “I disagree with the amendments, because the investigation is almost always superficial. There is no proper body of evidence, there is only the version the law-enforcement agencies insist on. This law could hit hard many people who never did the things they are accused of,” Akhmatova said in an interview with the BigCaucasus news website. Alexander Cherkasov, head of the Memorial human rights group, points out that no new laws are actually required to confiscate ill-gotten gains. "The question is: Does the new legislation target only ill-gotten assets, or any assets owned by the terrorists' relatives? This must not become some form of collective punishment meted out to people who may have had no idea what their brother or uncle were up to," says Cherkesov. Cherkasov also predicts that if passed, the new legislation will provide fertile ground for corruption. “To illustrate, we already have a law that allows the government not to release the bodies of dead terrorists to their families. The people who have the power to decide whether the deceased is a terrorist or not can well be persuaded to pronounce the deceased a law-abiding citizen and release his body in return for a bribe. The proposed new amendments also have a lot of potential to fuel corruption. Besides, it would be a mistake to think that terrorists are kindly people who are going to worry about the relatives they leave behind," says the NGO head. Cherkasov believes that stripping the terrorists’ families and relatives of their assets would be a spectacular PR move, but a very ineffective deterrent. Sergei Goncharov, the former head of the Alfa special task force, echoes these views. He insists that the proposed amendments still require a lot of work by legal specialists. “The proposals contain some legal terms that simply defy any formal justification,” Goncharov says. “For example, who exactly is covered by the term ‘in-law relatives?’"
These worries notwithstanding, the proposed legislation does have its advocates. Andrei Epifantsev, an expert in Caucasian affairs, argues that collective responsibility is actually part of the Caucasian tradition.